This trial assessed potential efficacy and benefits from various timings of fungicide application for managing powdery mildew, leaf rust and leaf spot diseases in wheat. Leaf rust was the dominant disease present. This trial falls under the western region project; Improving grower surveillance, management, epidemiology knowledge and tools to manage crop disease (DAW00229) funded by Grains and Research Development Corporation (GRDC). Flutriafol in-furrow (400mL/ha) applied across the site at seeding protected the crop from powdery mildew and rust up until crop heading (Z55). However, activity on leaf rust diminished at this stage and infection in plots without foliar protection progressed rapidly. Leaf rust has a greater yield impact than yellow spot or septoria nodorum blotch even if leaf rust is present at lower levels or appears later in the growing season. In susceptible varieties, such as Mace, apply foliar fungicide as soon as leaf rust found in paddock or nearby. The two leaf rust pathotypes 104-1,3,4,6,7,8,10,12+Lr37 and 76-1,3,5,7,9,10,12+Lr37 are recent incursions to Western Australia (2013 and 2015) and were both present in this trial, these pathotypes are virulent on Mace and caused significant yield loss. Foliar fungicide application for either disease during or after crop flowering is not likely to be effective, best timing will depend on the diseases present but optimum timing is more likely during the period of flag leaf to head emergence. The aim was to assess potential efficacy and benefits from various timings of fungicide application for managing powdery mildew, leaf rust and leaf spot diseases in wheat. 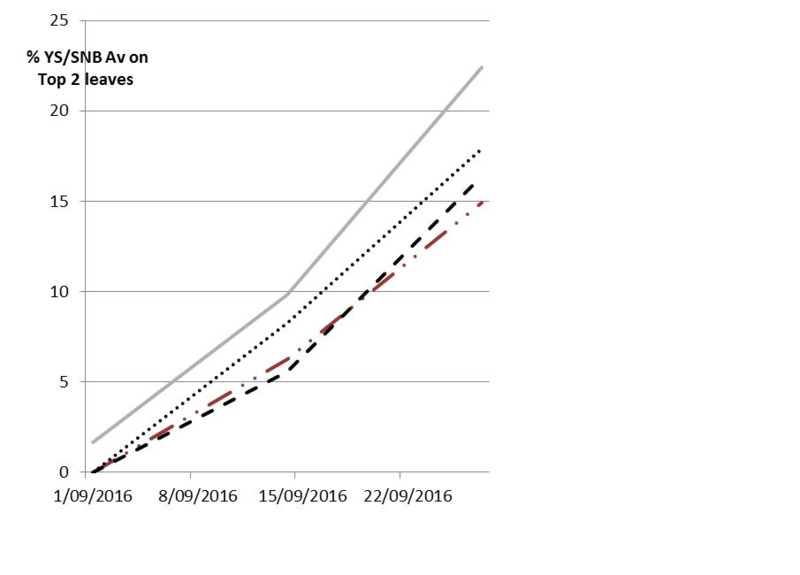 The trial was established in a grower's Mace wheat paddock on 3 August 2016 when the crop was at Z39 growth stage, when early powdery mildew symptoms were first observed on the lower leaves at the edge of the paddock. Wheat powdery mildew was a significant issue in 2015 in the northern wheatbelt and was a challenge to control in susceptible variteties. Mace is rated moderately susceptible-susceptible to powdery mildew. Two new wheat leaf rust pathogens were found in WA, one in 2013 and one in 2015, resulting in Mace being rated as moderately susceptible to leaf rust. There was a need for information on optimal fungicide application timing for effectively managing both diseases in Mace. Dates of fungicide applications: 3 August (Z39) (flag leaf, trace powdery mildew/yellow spot and septoria nodorum blotch),16 August (Z55) (head emergence, leaf rust first detected), 1 September (Z65) (flowering, leaf rust developing). Flutriafol in-furrow (400mL/ha) applied across the site at seeding by the grower protected the crop from significant powdery mildew and rust up until crop heading (Z55). Initially in early August (at Z39) there was a trace of powdery mildew low in the canopy but it was gone in September. Leaf rust was first detected in crop on 16 August 2016 when the crop was at Z55, a few leaf rust pustules were found on the outer edges of the paddock that the trial was in but not easily found in the trial area itself. There were two leaf rust pathotypes detected (104-1,3,4,6,7,8,10,12+Lr37 and 76-1,3,5,7,9,10,12 +Lr37) both of which have increased virulence in Mace, as evidenced by the level of infection in untreated plots and subsequent yield impact. Leaf spot diseases (yellow spot and septoria nodorum blotch) progress (Figure 1) shows that the best fungicide application in this trial for yellow spot/septoria nodorum blotch diseases was the historically accepted optimal timing of Z39. Spraying at two (Z55) and four (Z65) weeks after flag leaf emergence gave less effective disease control, as infection had already occurred while leaves were unprotected. 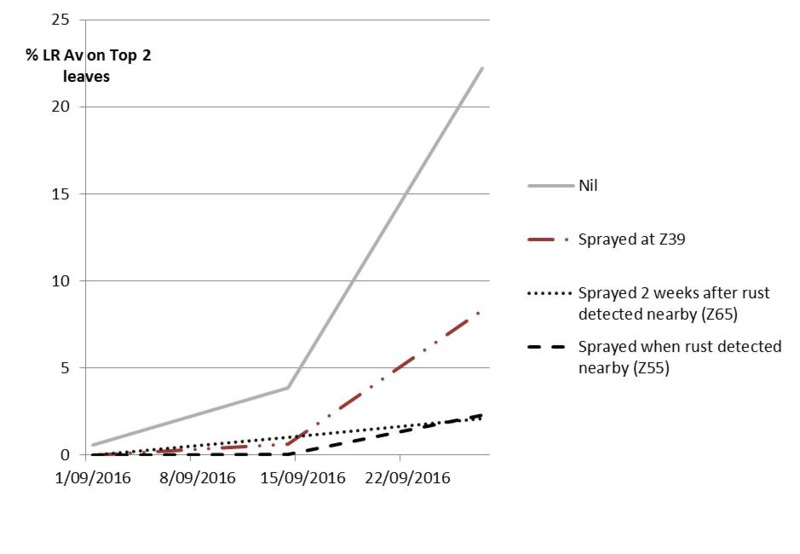 For leaf rust on the other hand, this trial showed it was more important to apply fungicide when rust was first detected in the area rather than delay for two weeks or rely on earlier growth stage timings (for example, Z39 - Figure 2). The only significant yield response in the trial was from the foliar fungicide applied at time of rust detection Z55 (4.7t/ha compared to untreated which was 4.3t/ha - Table 2). Fungicide applied at this time was able to protect leaves as disease was developing, while the protection from the earlier spray had diminished by this time and the later spray allowed too much infection to establish before spraying. There were no grain quality responses to fungicide treatments. Average quality measurements were: protein 8%, screenings 1.6%, 1000 grain weight 47.2g, hectolitre weight 84.8kg/hl, and moisture 9.9%. Price notes: $277/tonne. All prices net delivered Geraldton and GST exclusive. Fungicide application $9/ha, Prosaro® at 300mL/ha price $21/ha. Kathryn Fleay and Mingenew Irwin Group for hosting the trial. DPIRD research support unit for harvesting the trial. The research undertaken as part of this project is made possible by the significant contributions of growers through both trial cooperation and the support of GRDC, the authors would like to thank them for their continued support. GRDC project number: DAW00229 Improving grower surveillance, management, epidemiology knowledge and tools to manage crop disease – WA. This print version was generated at 7:08pm on the 21st of April, 2019.